Fri 15. Grey Hen Press. London launch of the new chapbooks Shades of Meaning, Transitions and Outlook Variable at The Queen’s Larder 1 Queen’s Square London WC1. Readings by various contributors. 7.30 onwards. Free event, all welcome. Sun 24. Torriano Meeting House poetry reading. With Jane Grell + others. 7.30pm. Admission £5/£4 (according to pocket). 99 Torriano Avenue, Kentish Town, London NW5 2RX. More info here..
Sun 31. Torriano Meeting House poetry reading. With Marina Sanchez and Jeri Onitskansky. 7.30pm. Admission £5/£4 (according to pocket). 99 Torriano Avenue, Kentish Town, London NW5 2RX. More info here. This entry was posted in Poetry Events, Shortlands Poetry Circle on April 28, 2015 by shortlandpoetrycircle. On April 21st. nine of us gathered at Jennie’s house to read our chosen poems. Poems from all periods and types were read from Cavafy through Hardy to the very amusing Peter Phillips. The good thing is that there are always some surprises and every poem read is received with interest. Over tea there was a discussion of future readings by members in the community as we consider that to be part of our function. Many thanks to Jennie for accommodating and refreshing us. It was a very enjoyable afternoon. This entry was posted in Shortlands Poetry Circle and tagged poetry events, shortlands poetry circle on April 28, 2015 by shortlandpoetrycircle. 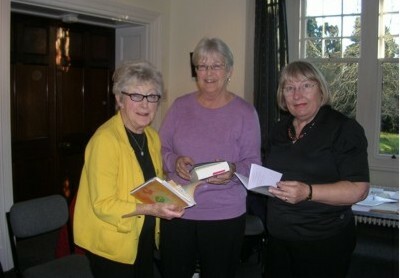 Anne Stooke on the left with Diane Chorley and Nola Turner. “Why do I like poetry? Perhaps because my father was an earnest young man and the product of the self improvement movement that founded the WEA in the early part of this century. He owned a book called “The Comic and Humorous Reciter” as well as volumes of Victorian poets (He also made himself a cat’s whisker radio and took sepia photographs which he developed in the sun.) I guess he was an early influence on me. Also, I was sent to a two woman dame school where nature study and learning poems by heart were the main planks of the curriculum. I was a teacher in inner London schools for twenty years but in retirement, my husband and I had a small boat. I was the crew, and because, to read makes you seasick, I spent the long hours between ports learning poems. They have been invaluable on sleepless nights. This entry was posted in Shortlands Poetry Circle and tagged Anne Stooke, member profiles on April 4, 2015 by shortlandpoetrycircle. Entry fee: £5 per piece (£4 per piece for 3 or more entries). Prizes awarded for the best three short stories and best three poems. This entry was posted in Competitions and tagged Barnt open poetry competition, Poetry Competition, poetry competitions, Rhyme & Reason Writing Competition 2015, Segora poetry competition on April 3, 2015 by shortlandpoetrycircle. Publicity material for this event says: “I write in English, but the ghost of Irish hovers behind it; and English itself is full of ghostly presences.” Ciaran Carson is the author of nine books of poetry and winner of the T S Eliot Prize and the Forward Prize for Best Poetry Collection. He is currently Director of the Seamus Heaney Centre at Queen’s University, Belfast. Supported by Arts Council England. 7 – 8.30pm Free, booking recommended. Need some help with your poetry writing? Get a slice of feedback from our Poetry Butcher, Clare Pollard. Not for the faint-hearted, our butcher will cut straight to the heart of your poem with her razor-sharp critical expertise. Only one poem should be brought along on the day, which should be one page of A4 at the most. This seminar explores the connections Paz made with British literature and academic life In 1970, Mexican Nobel Laureate Octavio Paz was a Professor at Cambridge, a defining and transitional time in his career that sowed in him a life-long interest in Britain. This seminar explores this little-studied period and the connections Paz made with British literature and academic life. Join the Emma Press for the launch of our anthology of political poems, curated with passion and timed for the run-up to the UK General Election. We’ve collected poems which engage with the concerns of voters, including unconvincing politicians and social inequality. With readings from Mona Arshi, Kayo Chingonyi, Dai George, Jan Heritage, Holly Hopkins, Luke Kennard, Anna Kisby, Rachel Long, Richard O’Brien, Clare Pollard, Ewan Stevenson, Jon Stone, James Trevelyan and Kate Wise. Readings start at 8pm. with Mona Arshi, Anja Konig, Miriam Nash, Jacqueline Saphra, Rosie Shepperd, and Liane Strauss. This entry was posted in Poetry, Poetry Events and tagged Dodo Modern Poets, Keats House, Mandy Pannet Poets, Octavio Paz, poetry @ the print room, Poetry Butcher, poetry events, templar poetry, The poetry cafe on April 3, 2015 by shortlandpoetrycircle. This was the last meeting before Easter and the theme was ‘Heavens Above’ which prompted poems on planets, stars, clouds, night and heaven itself. Wordsworth and Gerard Manley Hopkins were well-represented, as was William Blake and we were treated to spirited readings of ‘Twinkle, twinkle Little Star’ and John Agard’s ‘Coffee In Heaven.’ Other poets visited were Maura Dooley, Penelope Shuttle. Anne Stewart and Daphne Cloag with an extract from her poem ‘Beginnings’ A poem was read from Simon Armitage’s ‘Cloud Cuckoo Land’ one of 88 poems which receives its title from a constellation. We look forward to recommencing our activities on April 28th. This entry was posted in Ripley Arts Centre, Shortlands Poetry Circle and tagged anne stewart, Daphne Cloag, Gerard Manley Hopkins, Maura Dooley, Penelope Shuttle, simon armitage, William Blake, Worsworth on April 3, 2015 by shortlandpoetrycircle. This entry was posted in Member Profiles, Poetry Events and tagged Isabel Bermudez, St. Brides Foundation, Wash House Poets on April 3, 2015 by shortlandpoetrycircle.